Are you a risk taker? Have you ever considered the reasons you participate in high-risk extreme sports? What personality traits do people possess that make them want to risk their lives? Rock climbing involves strength, control and finesse. Using the muscles in your arms and legs to pull your self up a sheer rock face takes strength­ and control. Using your brain to place your hands and feet so that your muscles can do their job – that's finesse. Rock climbing is a little like skydiving. Both rock climbing and skydiving have an element of danger. Both are sports where people participate mainly for their own personal satisfaction. These sports do not offer much for spectators­ and both are sports where potential participants either "get it" or they don't. In skydiving, either you are excited about leaping out of a plane into the abyss, or you aren't. In rock climbing, either you are excited about scaling a vertical piece of stone, or you aren't. The basic premise behind rock climbing is extremely simple. You are trying to climb from the bottom to the top of something. If that was all there were to it, then you would need nothing but your body and a good pair of climbing shoes. However, because of the serious possibility of falling, rock climbing involves a great deal of highly specialized equipment to catch you when you fall. When you're rock climbing outdoors on "traditional" routes, learning to use and properly place this equipment is at least half of the sport! Probably the easiest and safest way to get started in rock climbing today is to take lessons on an artificially built rock-climbing wall. There you will learn the basic techniques in a safe environment, build your strength and skills, and meet other climbers. 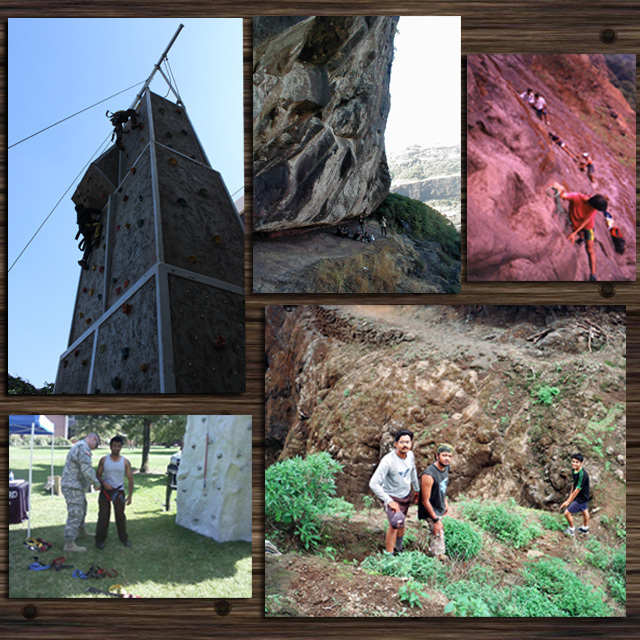 We provide a mobile rock-climbing wall at your organization premises with the necessary equipment and instructors. We also plan rock climbing and rappelling at locations around Pune where anyone can join us with or without any experience.